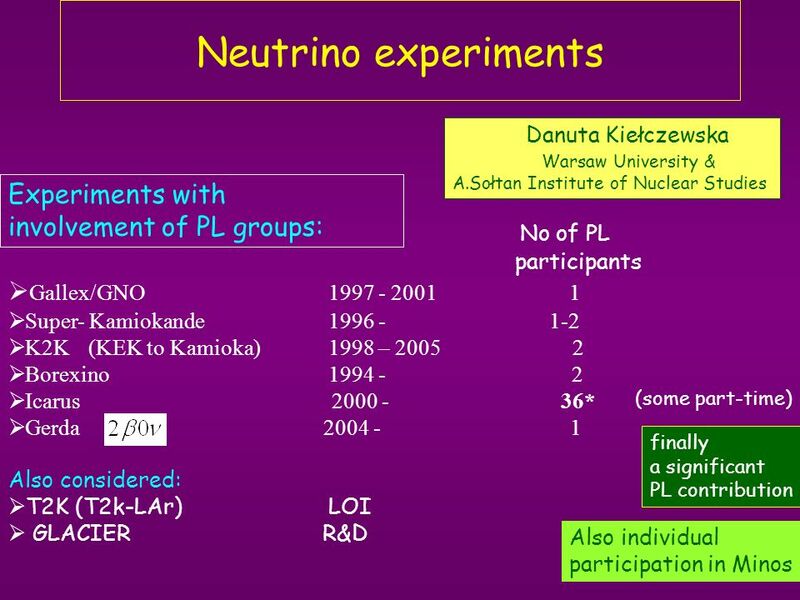 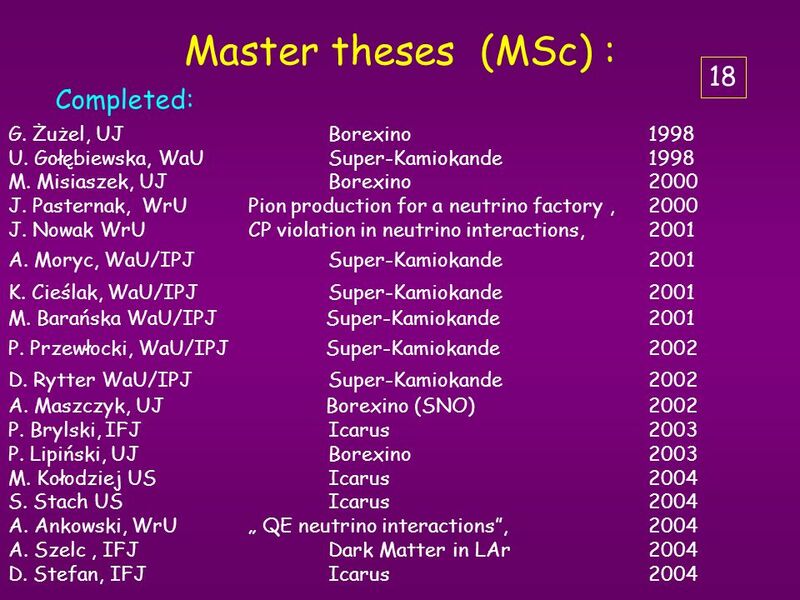 Neutrino experiments No of PL participants Gallex/GNO1997 - 2001 1 Super- Kamiokande 1996 - 1-2 K2K(KEK to Kamioka) 1998 – 2005 2 Borexino1994 - 2 Icarus. 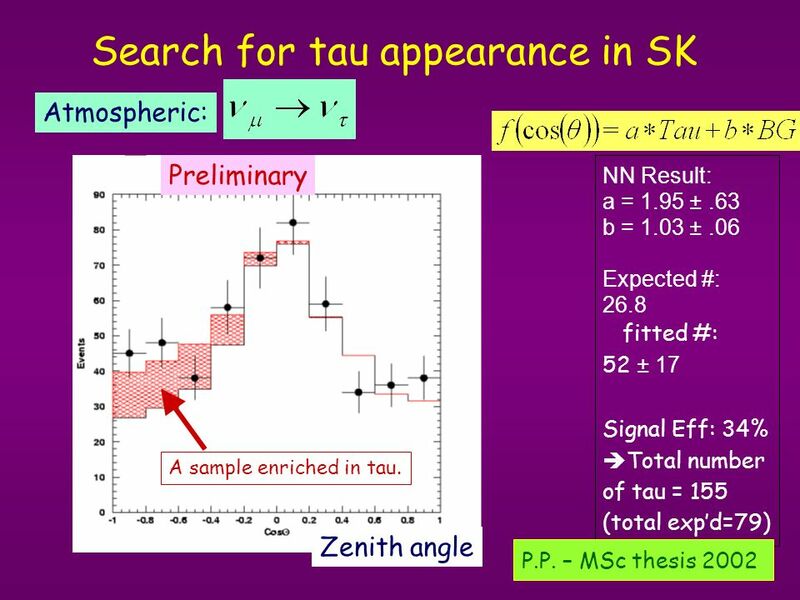 8 NN Result: a = 1.95 ±.63 b = 1.03 ±.06 Expected #: 26.8 fitted #: 52 ± 17 Signal Eff: 34% Total number of tau = 155 (total expd=79) Search for tau appearance in SK Preliminary Atmospheric: Zenith angle P.P. 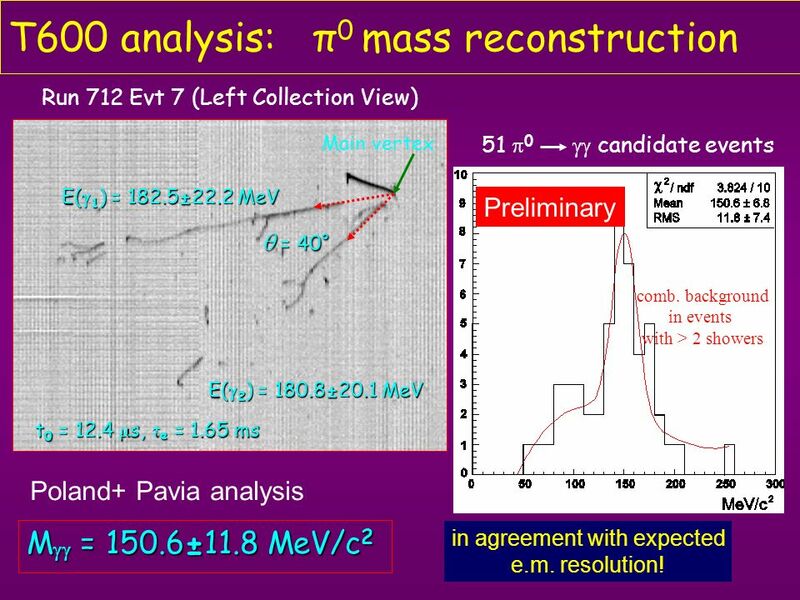 – MSc thesis 2002 A sample enriched in tau. 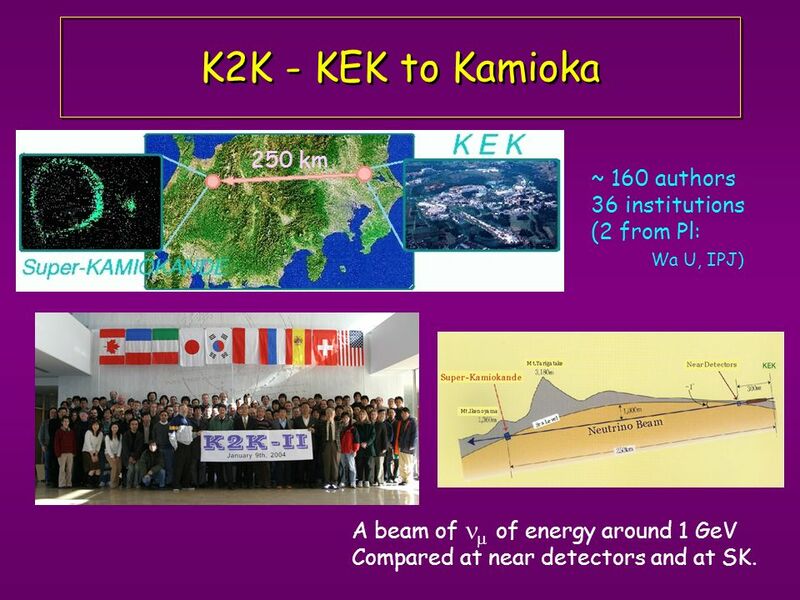 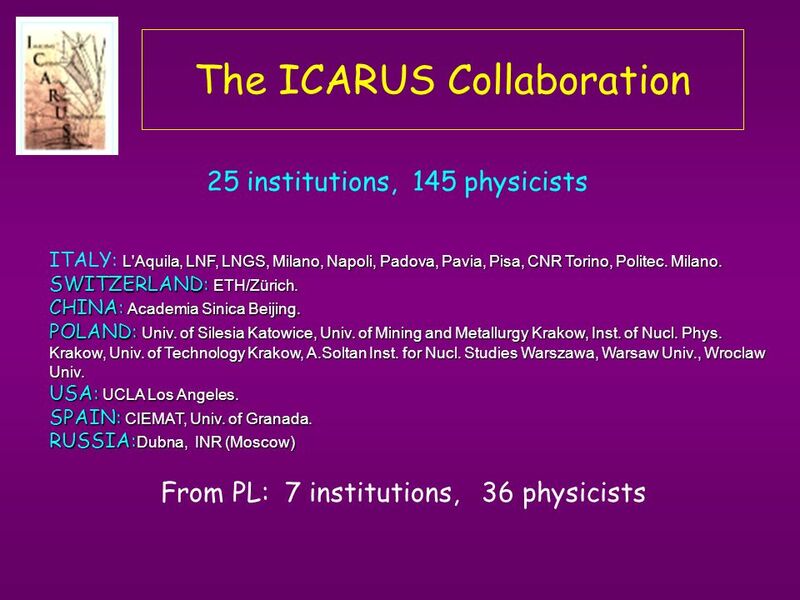 10 K2K - KEK to Kamioka 250 km ~ 160 authors 36 institutions (2 from Pl: Wa U, IPJ) A beam of of energy around 1 GeV Compared at near detectors and at SK. 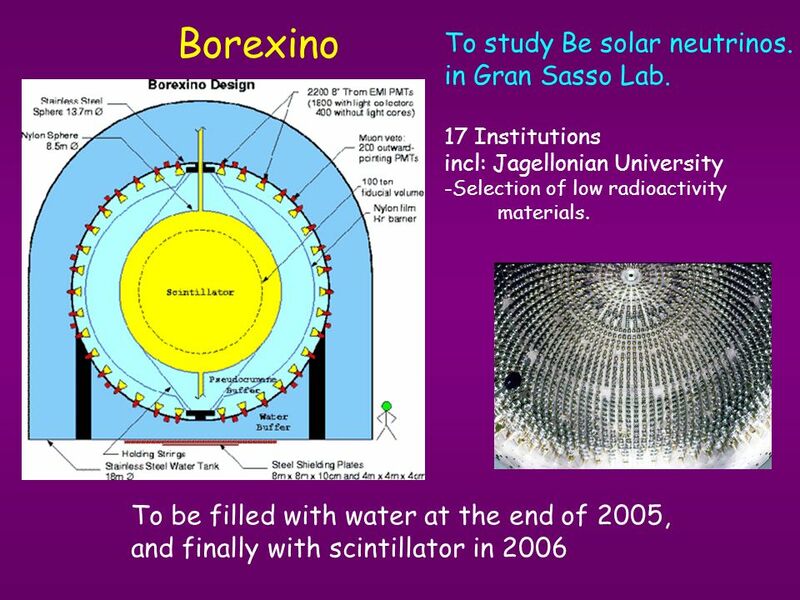 14 Borexino To be filled with water at the end of 2005, and finally with scintillator in 2006 To study Be solar neutrinos. 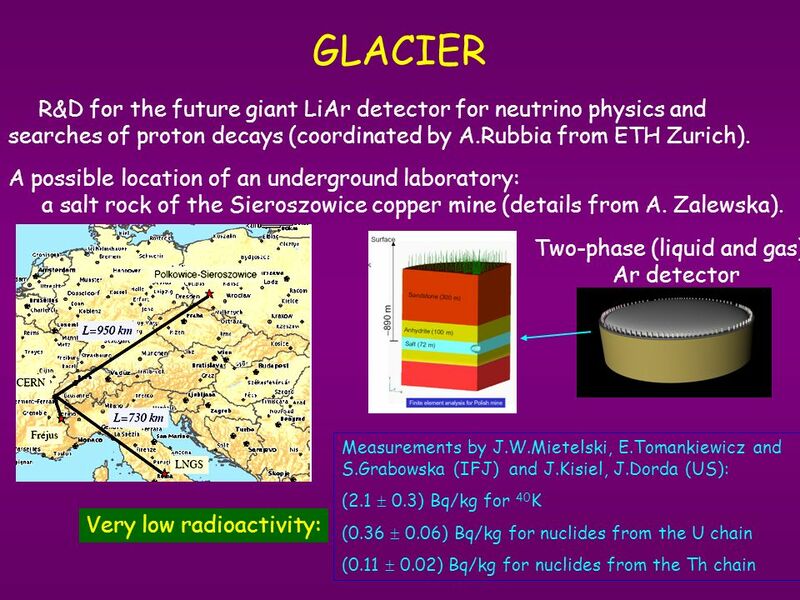 in Gran Sasso Lab. 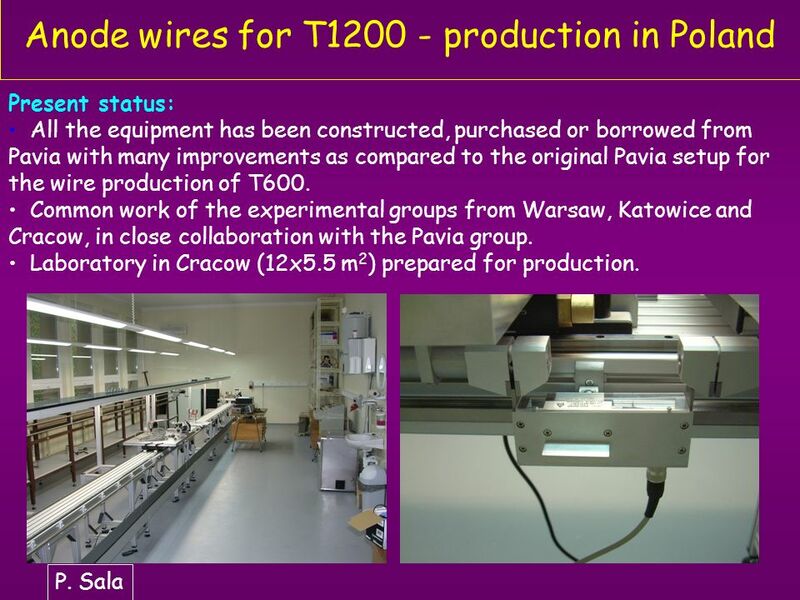 17 Institutions incl: Jagellonian University -Selection of low radioactivity materials. 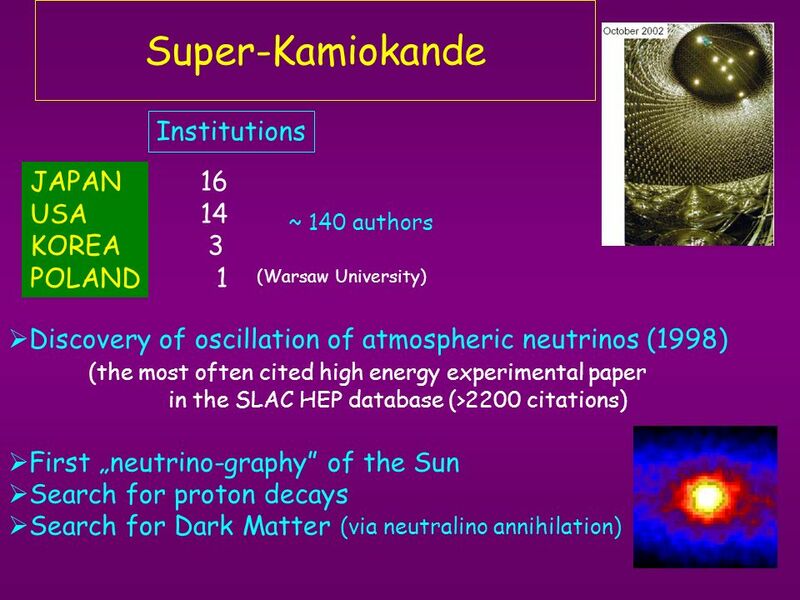 Download ppt "Neutrino experiments No of PL participants Gallex/GNO1997 - 2001 1 Super- Kamiokande 1996 - 1-2 K2K(KEK to Kamioka) 1998 – 2005 2 Borexino1994 - 2 Icarus." 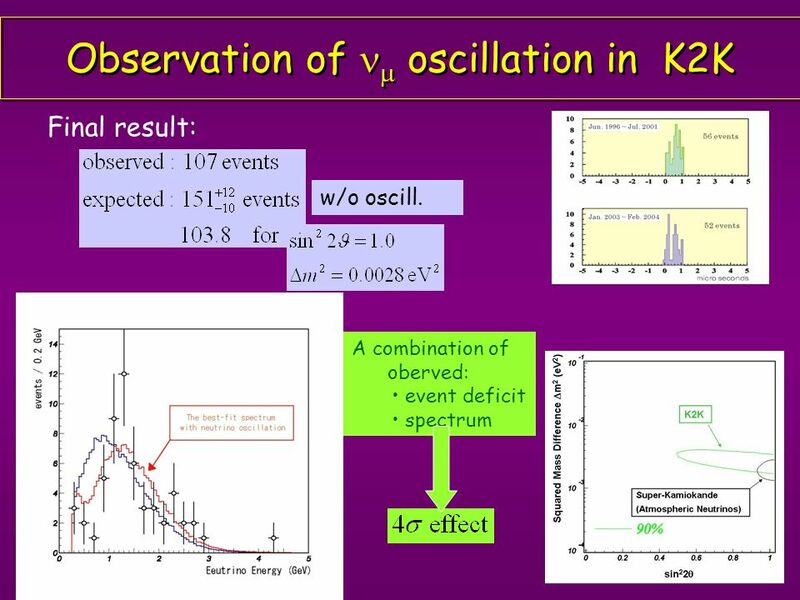 0 - Electron Discrimination in Liquid Argon Time Projection Chamber. 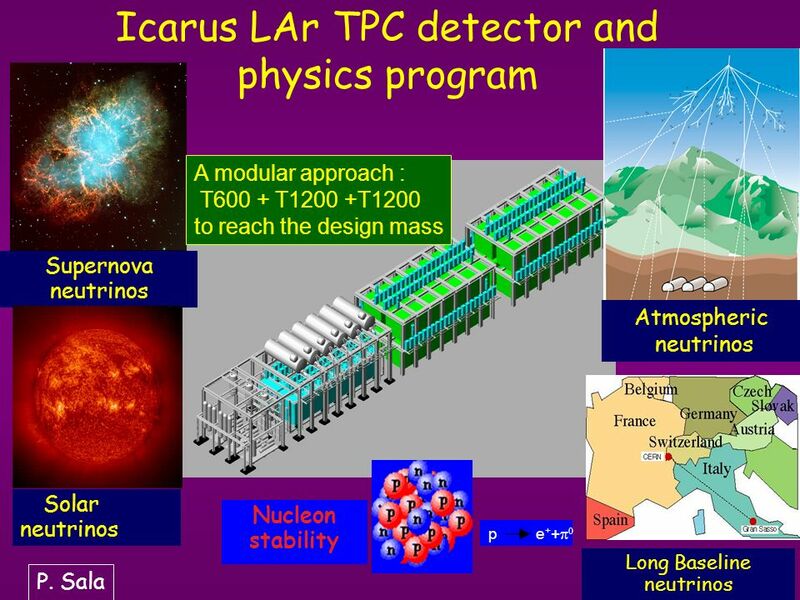 1 HARP A fixed-target experiment at the CERN Proton Synchrotron ( ) Hadron Production Experiment (PS214) Neutrino Factory Atmospheric Neutrino. 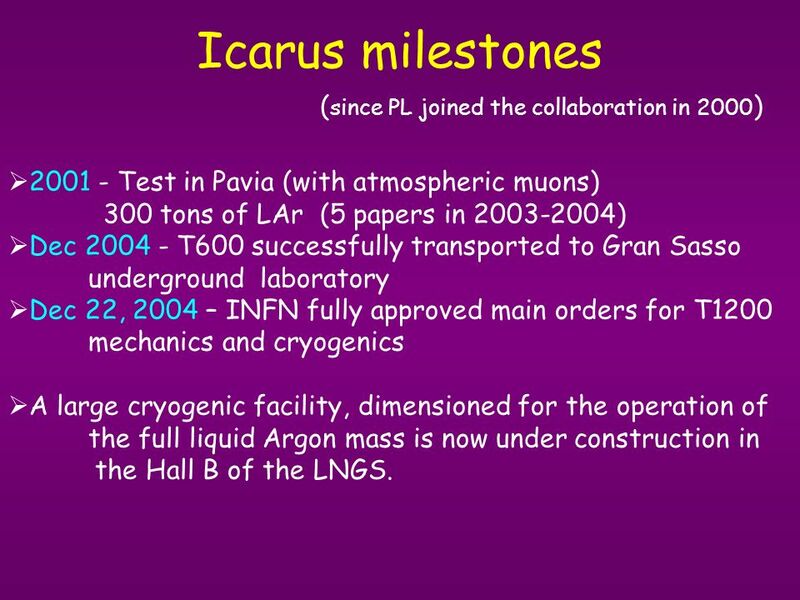 F. Arneodo Imaging 2003 The ICARUS T600 Liquid Argon Time Projection Chamber Francesco Arneodo Laboratori Nazionali del Gran Sasso on behalf of the ICARUS. 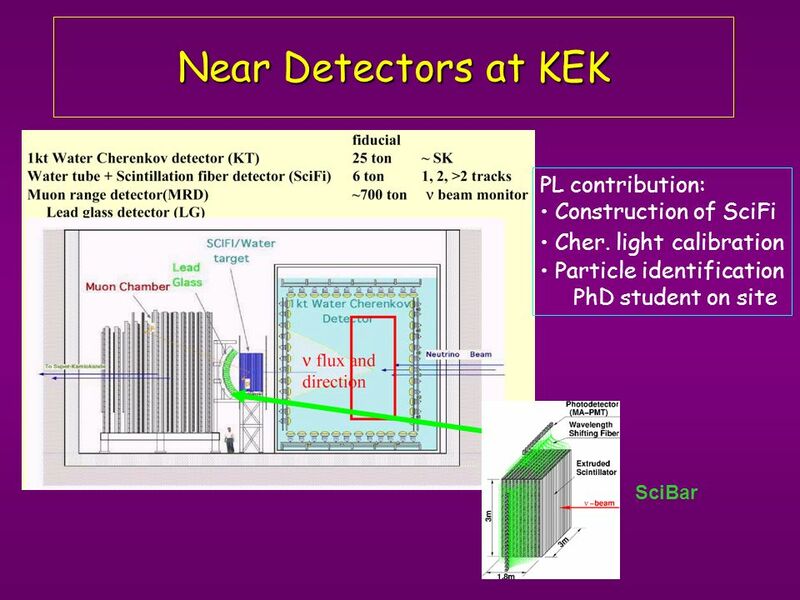 INFN Milano, Universita` degli Studi Milano Bicocca Siena IPRD May Testbeam results of the CMS electromagnetic calorimeter Alessio Ghezzi. 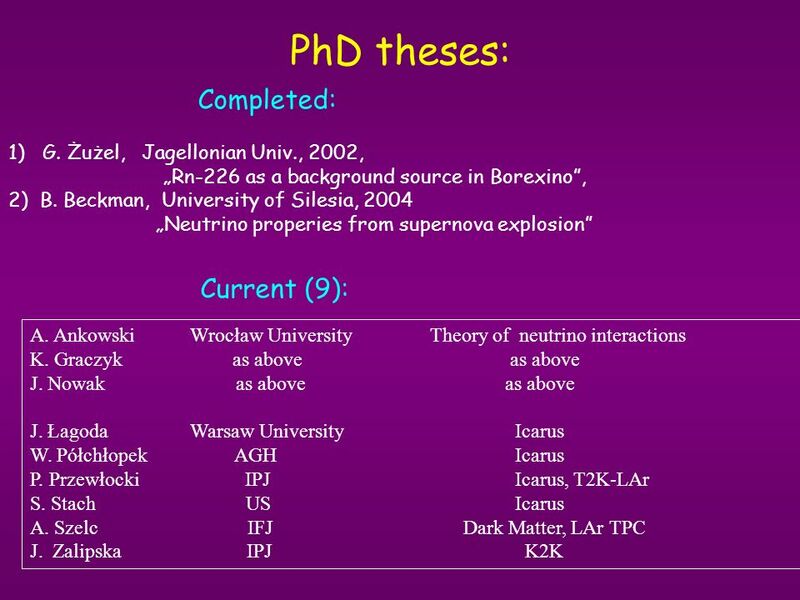 COBRA A new Approach to -Decay UK HEP Forum, Abingdon, May 11 th, 2003 Daniel Muenstermann University of Dortmund COBRA. 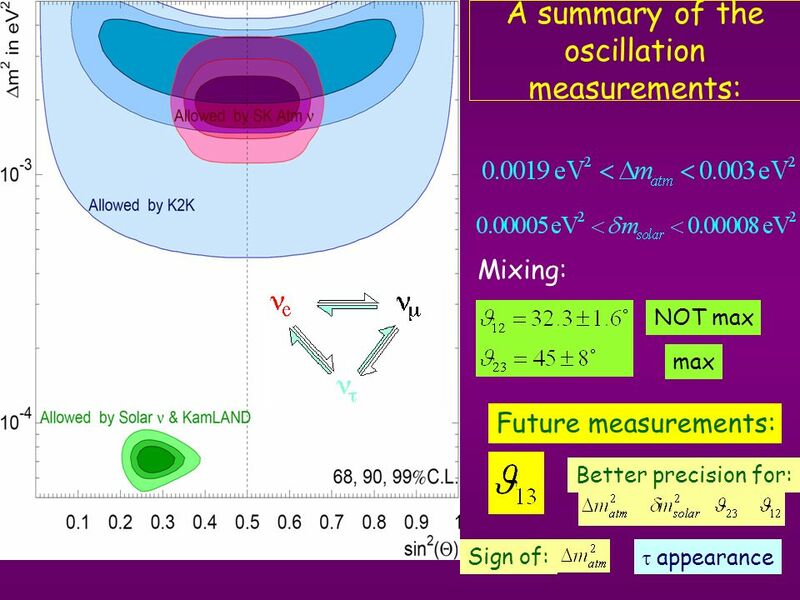 IS THE NEUTRINO A MAJORANA OR A DIRAC PARTICLE ? 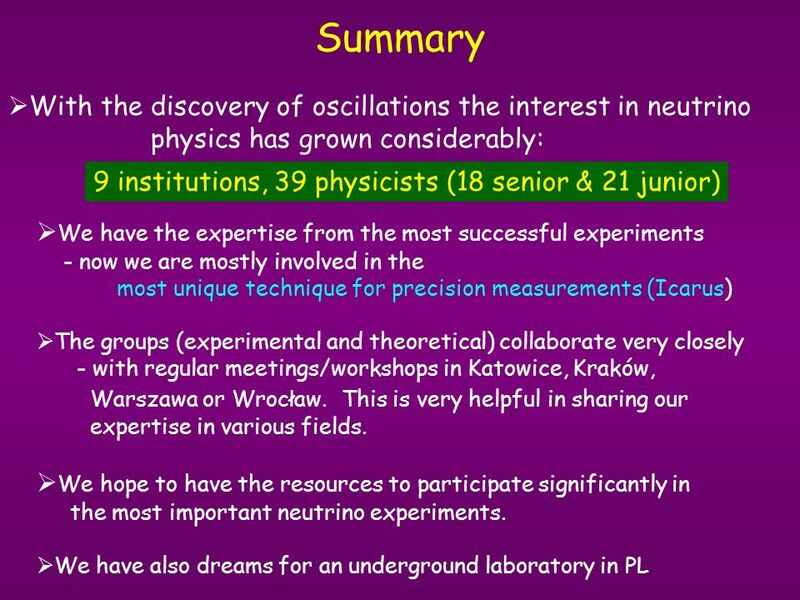 Ettore Fiorini, Bologna June or Lepton number conservation or violation Has neutrino a finite. 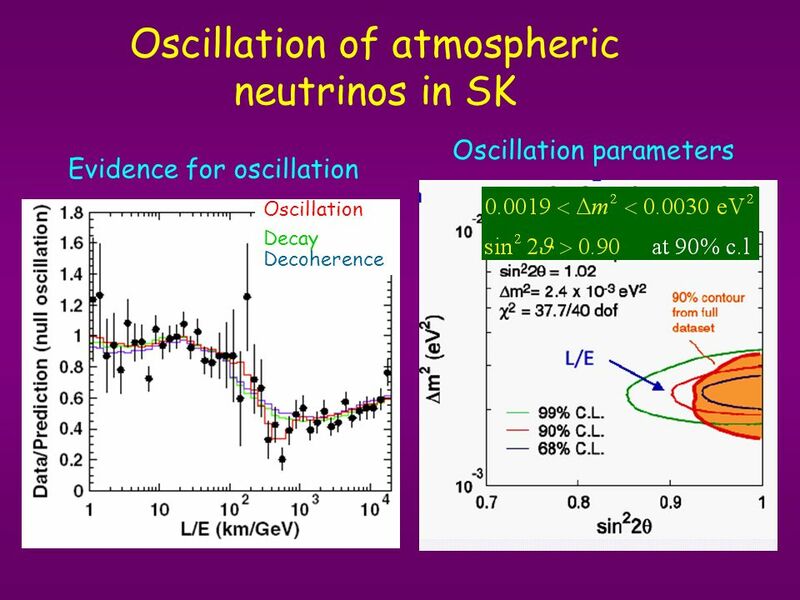 1 Neutrino Oscillations Gianluigi Fogli Università di Bari [ The most exciting Adventure in Physics of the last ten years ] Laurea ad Honorem to Prof.
26/01/05A. 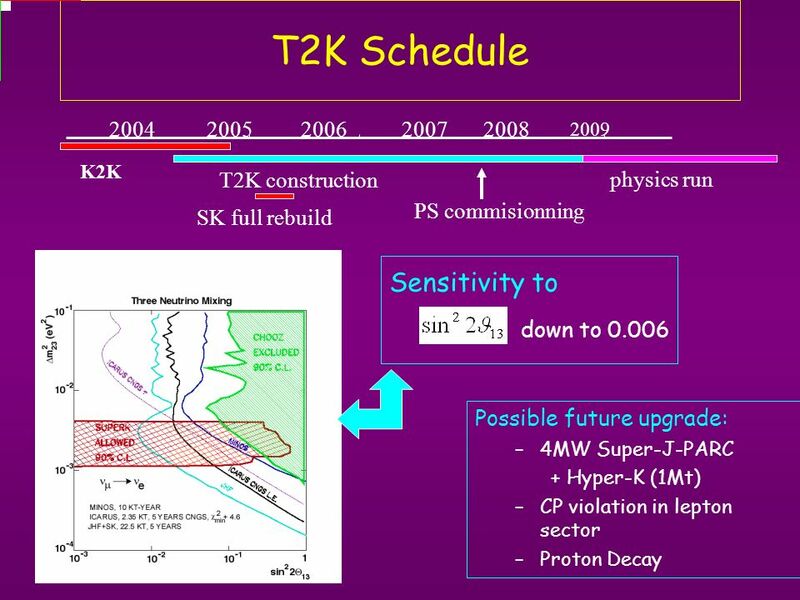 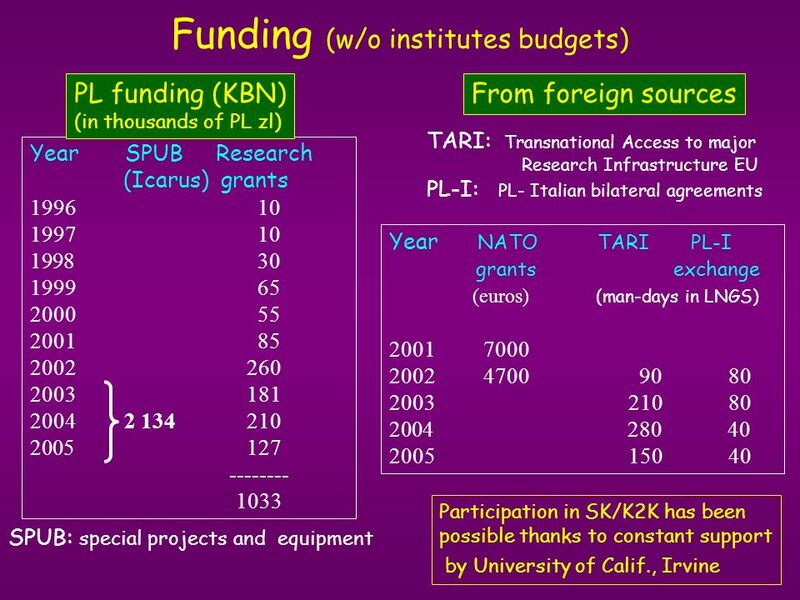 Geiser, Discussion on T2K 1 Participation in T2K neutrino program? 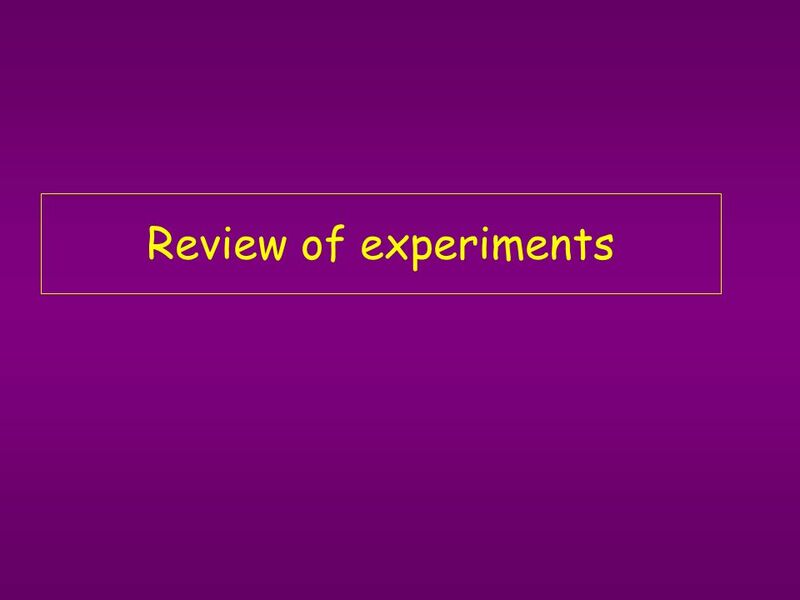 benefits, options, and opportunities nIntroduction nOutline of current questions. 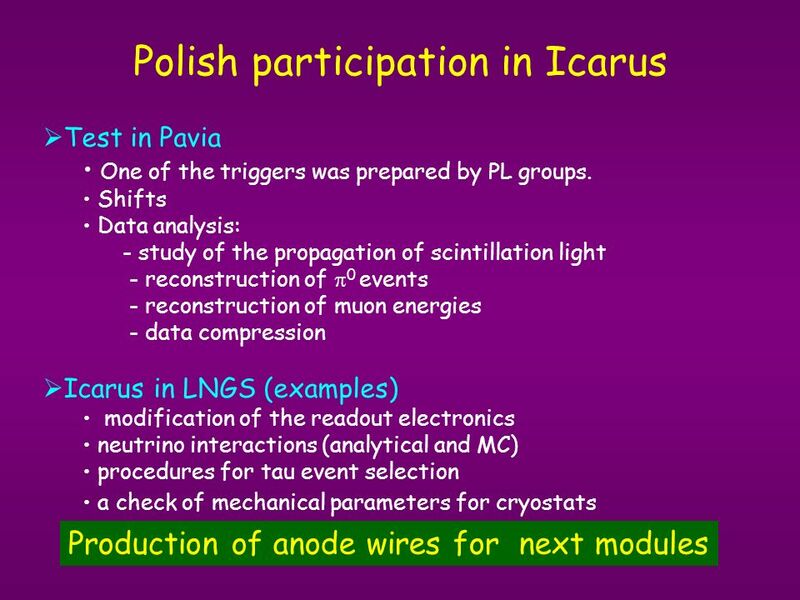 Liquid Argon technique: a pizero identification analysis for T2K beam Paweł Przewłocki, A. Soltan Institute for Nuclear Studies, Warsaw Warsaw Neutrino. 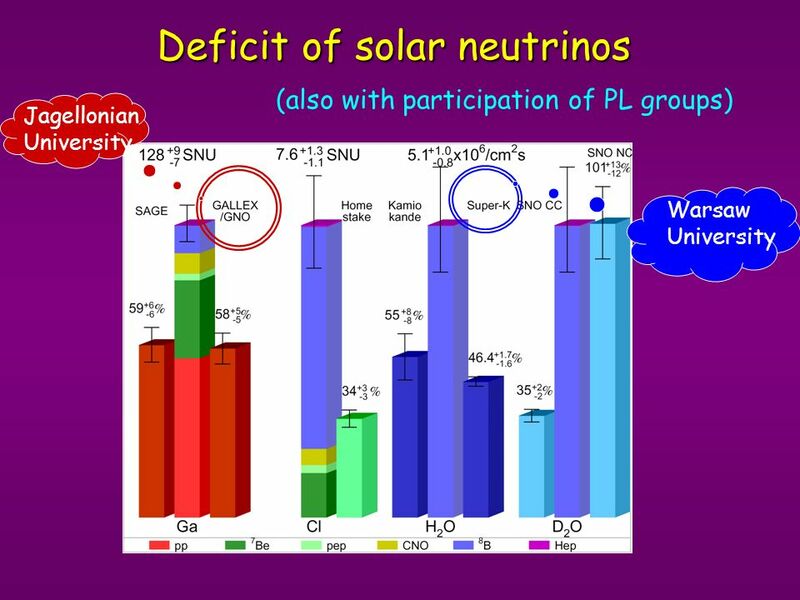 Neutrino physics, experiments III – Atmosferic Neutrinos João dos Anjos Centro Brasileiro de Pesquisas Físicas. 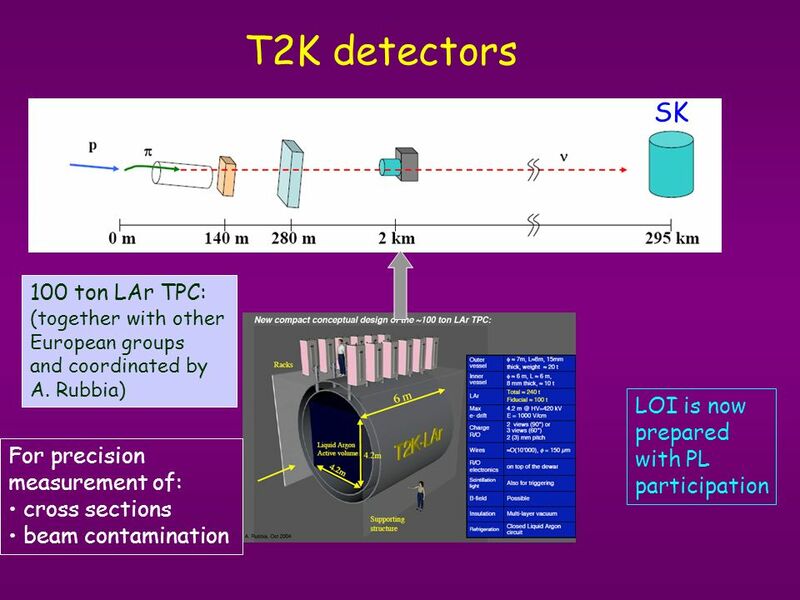 Proposal to join NEMO-3  decay experiment P. Adamson, R. Saakyan, J. Thomas UCL 27 January 2003. 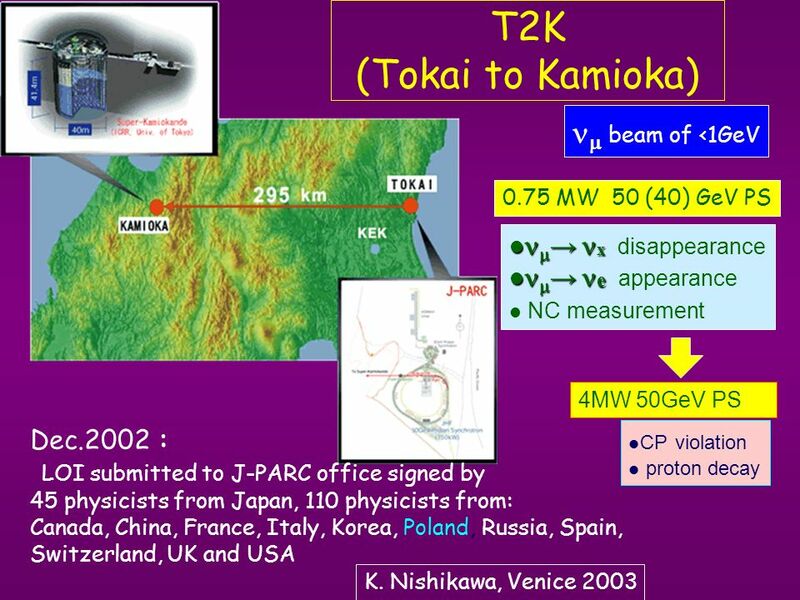 1 J-PARC and T2K 1.Accelerator construction status and commissioning 2.Accelerator upgrade plan in first 5 years 3.Experiments with slow extracted beam.